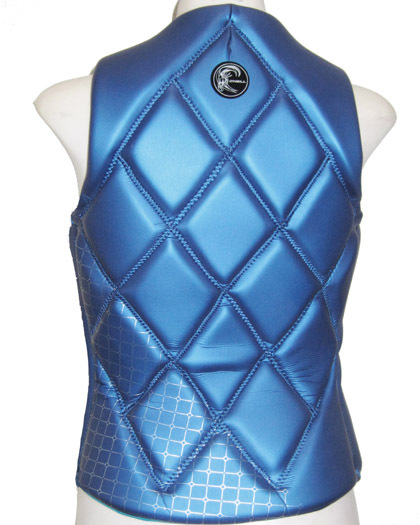 The Oneill Gem Competition Vest in Blue for 2019 uses the most advanced neoprene called Nytrolite, Lighter, dryer, more bouyant, more impact resistant. Multi-segmented core design with front zip and large armhole size. Super strong seams. Beautiful competition wakeboard or waterski vest for women. Blue with silver gray accents and Aqua interior. Vest stretches nicely for a good form fit. 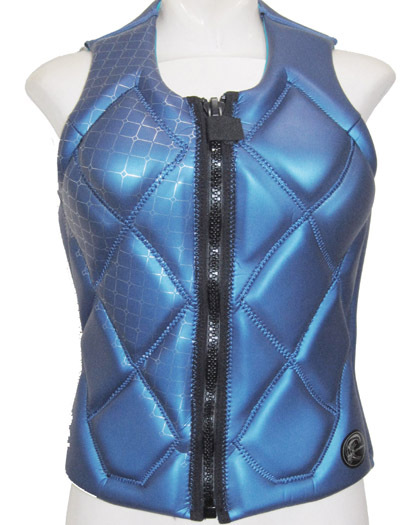 Nytrolite feels like a rubberized neoprene on the outside and has a soft cloth neoprene layer molded to the inside of the vest for superior comfort. Low Density Polyethylene is expanded using Nitrogen in an exclusive process which cannot be duplicated. 3x lighter than PVC foam. Closed cell foam structure that absorbs 15-20 percent less water. 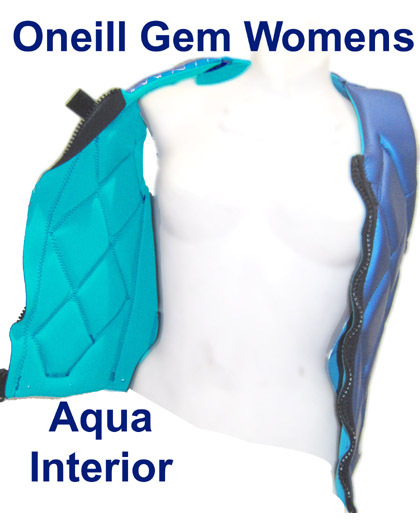 Approximately 10 percent more buoyant than PVC meaning we can use less foam in each vest and it will still float the same. WARNING: *THIS VEST IS FOR COMPETITION WATERSKIING AND WAKEBOARDING. IT IS NOT APPROVED BY THE U.S. COAST GUARD. THIS IS A WAKE AND WATERSKI WETSUIT GARMENT.